I’m on holiday this week (from the day job at least) and one of our activities was a day trip to Windy Lake Provincial Park. 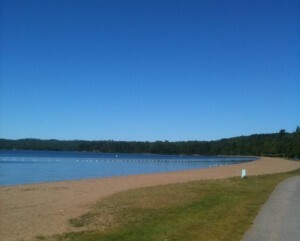 We had a great time – the lake is beautiful and there is a very nice beach which the kids loved. We checked out the campsite area and it appears that all of the sites are quite large and most are very private. Best of all they have some sites with Yurts – which are basically a cabin in the campground. A yurt site has a building with electricity along with a propane bbq. This will make camping a bit easier as you don’t need a tent or stove. Of course purists will say it’s not “real” camping, but I don’t care. All I know is that camping with two little kids is a ton of work and if “cheating” a bit allows us to go more often, then that’s what we’ll do. I did an interview with Roma Luciw of the Globe & Mail this week. She does a weekly “tips” column and I should be in the one next Monday or the week after. The topic will be “Withdrawing from the RESP”. We are also looking at doing an online discussion on that same topic which should be fun. 2nd edition of the RESP Book (print edition). 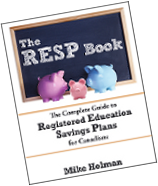 Release a Kindle version of the RESP Book (2nd edition). Release a Kindle mini-book which will just contain the withdrawal information from the RESP Book. This will be called “How to withdraw money from your RESP” or something similar. This mini-ebook will be aimed at people who are too cheap don’t want to buy the entire book, since they only want to know how withdrawals work. In other news – Mike Holman came up with 8 reasons why you should use a real estate agent. Squawkfox wrote a hilarious post on the costs of collecting. Just go read it. The Finance Buff says that most investors don’t sell everything in a panic. The Blunt Bean Counter writes about some common investment errors he sees in his practice. Moshe Milevsky asks the very good question – How long can home prices keep rising? Five Cent Nickel did an interesting analysis of the stock market last week. He calculated how much of a loss a buy and hold investor had for the week compared to someone who tried market timing and got it all wrong. The results are quite interesting. My University Money reviewed the excellent Michael Lewis book “Liar’s Poker”. Boomer & Echo has an amusing article of useless gadgets you shouldn’t spend money on. Jim Yih come up with 5 very good realities of the stock market. David Swenson who runs the Yale endowment fund, slams the mutual fund industry. Canadian Capitalist comments on the Swensen article. Michael James says that mutual fund MER charges are still significant during turbulent market swings. Million Dollar Journey has 5 tips to buy your dream house. Mike, thx for link. As for cheating, with smaller kids, anything that makes life easier and keeps your sanity is allowed in my books. Enjoy your holiday. Thanks for the mention. Thanks for including me Mike! I’ve never heard of a yurt before, sounds perfect for camping with kids. Looks beautiful! Enjoy. Thanks for the mention. Thank you for the mention. Have a good time at the lake!